What do you get when you have complete freedom for creative thinking by your client? 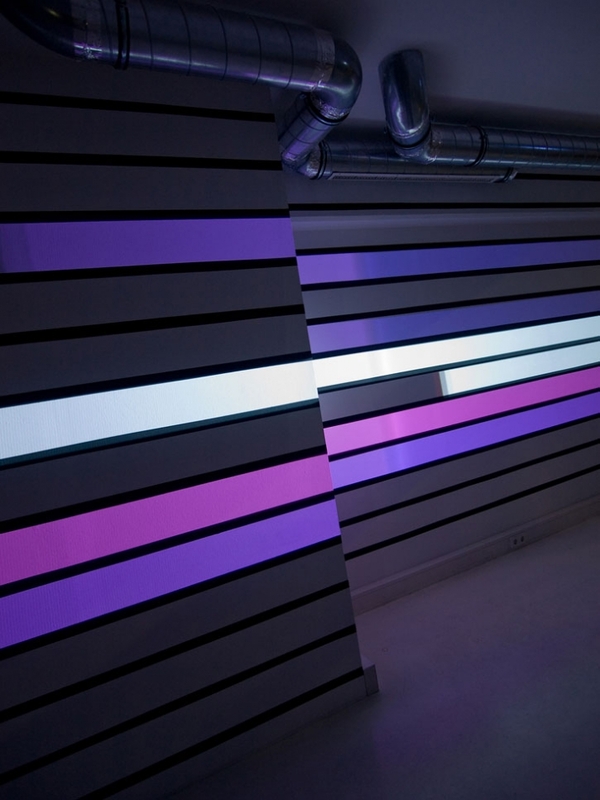 A project worthy of the "Ambient Design" Creative Club Award in Austria. Strukt, a design studio out of Vienna, Austria, developed a fun, creative and practical design solution for virtually any surface. 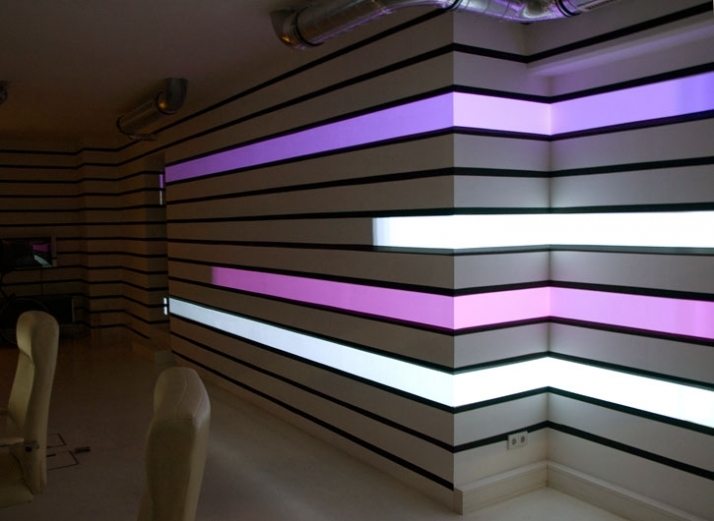 Starting with a black and white striped office wall of Büro Hirzberger in Vienna, the designers of Strukt Studio began to project light on the wall surface. 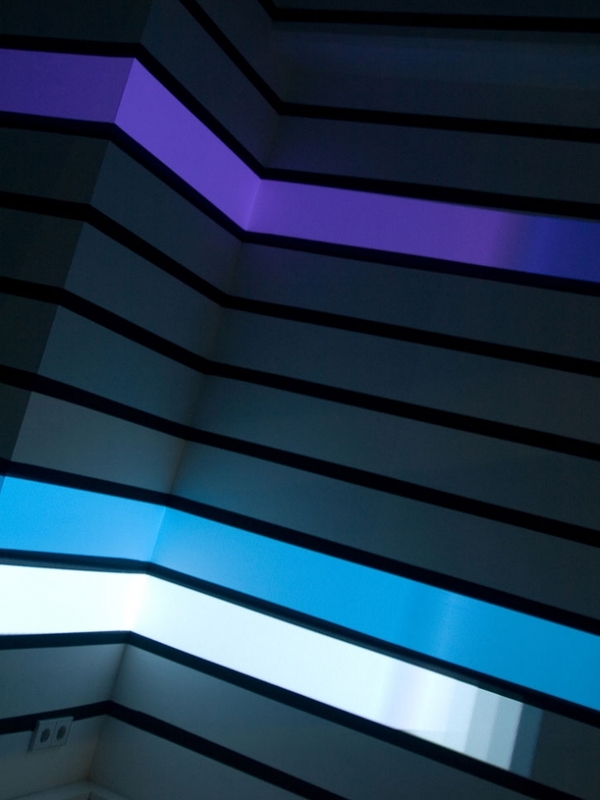 Playing with the scale and linear divisions of the partition, the program of light began to take shape and form as the images of light danced over the wall. Not only do we see moving stripes, the project also includes a playful interaction of pac man moving across the created screen. 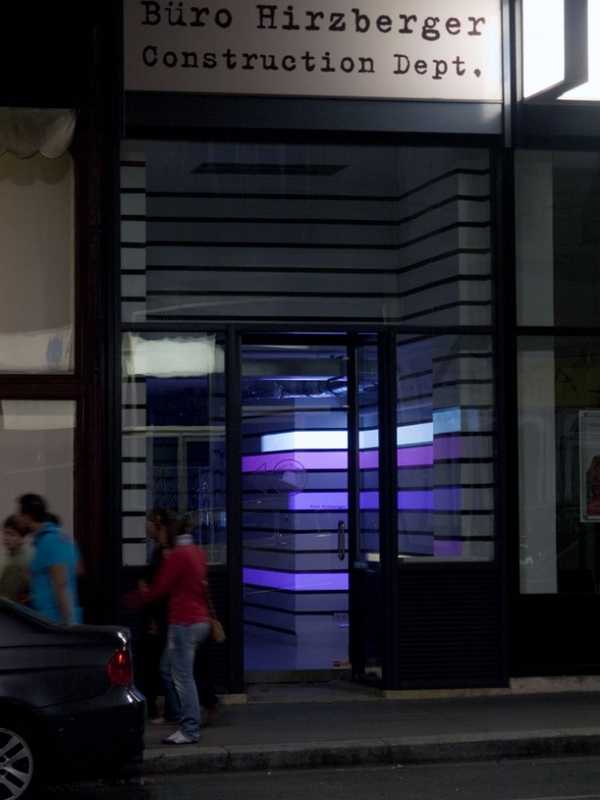 Strukt has developed the software to also be interactive with the public- allowing passersby the chance to stop and play for a moment on the way to their final destination. What's so intriguing about this installation is the life it brings to an ordinary wall surface. 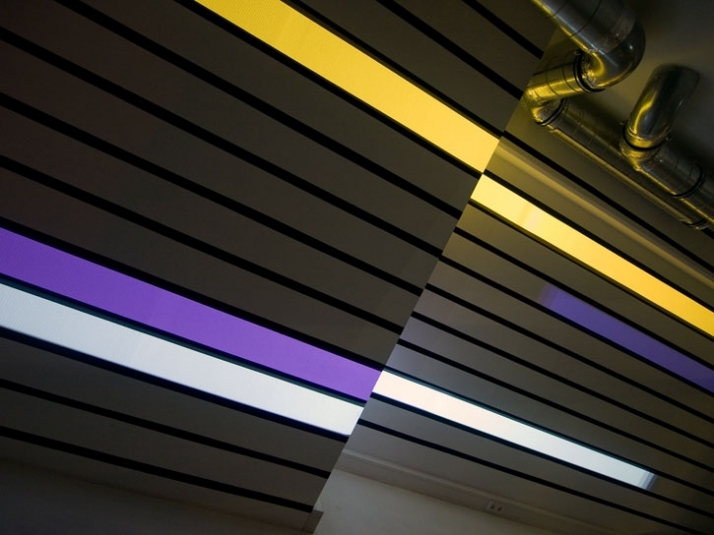 Without harming the existing texture, colors or finish you can dramatically change a wall and a space for the benefit of those experiencing it. Even better is the location of this instal - at street level, allowing people to enjoy it all hours of the day. The movement of the projected light is entertaining and enjoyable. As the light moves over a surface, one becomes engaged and somehow pleasantly distracted. The options for design and final output almost seem limitless; this software definitely is calling for another client allowing the freedom for creative thinking! Because the project image is best viewed in a lower light setting, there may be some limitation to the extents of its use, setting the mood and ambiance for the project location. I can see this project playing along with music for an event. Be it a corporate dinner party or a wedding reception- the mobility of this dynamic art form allows it to be easily applied to your upcoming event. The project instals add life where there normally would not be. They bring attention and interest to a space even after normal business hours have passed. It creates a connection between the interior environment and the streetscape; causing people to stop. pause. and just watch. The precision in the planning and careful placement of the rays of light is just astonishing. Dynamic color and movement seem like such a simple gesture, however in this context they create a playful work of art that is memorable and entertaining. Perhaps a glimpse of the might become typical not too long from now. Expect more great work from this team. Strukt Studio is a design agency specialised in events and exhibitions. It’s working field comprises interactive, generative, motion and graphic design. The five founders met in 2002 during their multimedia art studies, when they started Strukt as a student initiative publishing a design magazine. The project then evolved to be a visual live performance network. That time and the following years after university they gained professional backgrounds in live visuals, animation production and design. These various experiences eventually defined the work of Strukt Studio. 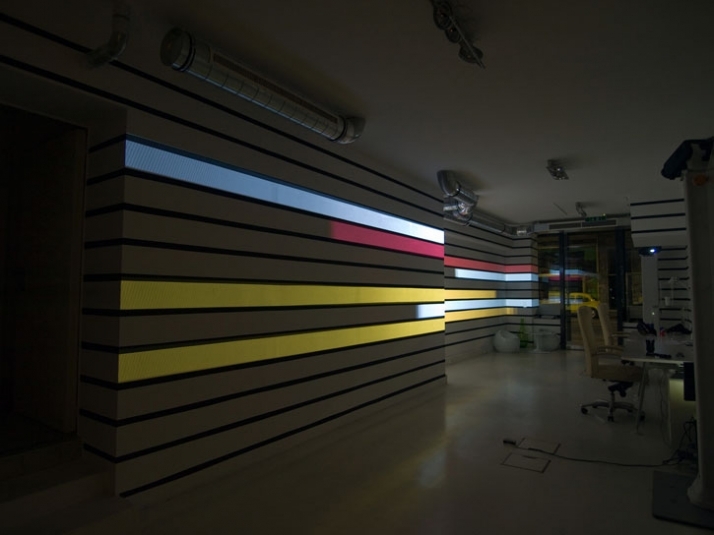 Since its foundation in 2007, the viennese studio worked for renowned clients, realizing interactive installations and motion design works in the area of corporate and cultural events.